Fauve painters such as Andre Derain, Henri Manguin, and Albert Marquet also influenced the artist. She is attracted to their boldness and non-conformity, which is reflected in their use of strong light, high key, saturated color, and thick impasto. Ms. Chatwell frequently paints nocturnal scenes in which the center of interest is a small area of light, expressing her experience of a higher power, always available to guide one out of danger and despair. She was influenced by Whistler's style of nocturnal painting. In the 1990's Ms. Chatwell studied with master painter, Michael Linstrom, who encouraged her to trust and follow her intuitive style of painting from the inside out, thus affirming her deep love of self expression. She and Mr. Linstrom now often exhibit their paintings together. The artist spends a few weeks in Paris every year. She paints Parisian street scenes and interiors to express her love of the ambiance and architecture of the city. 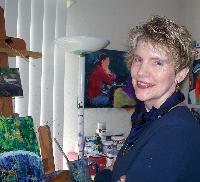 She particularly enjoys painting scenes in which people are depicted doing ordinary, everyday activities. Ms. Chatwell loves the process of painting so much that she spends every spare minute at the easel. She becomes absorbed to such a degree that she loses track of time and often paints for hours without once leaving the studio. While performing the necessary chores and tasks of daily living, she is calculating the amount of time that will elapse before she can to return to her beloved passion.